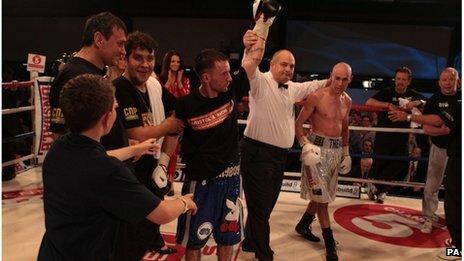 Bristol boxer Lee Haskins won the European Bantamweight title after out-pointing opponent Stuart Hall. The 28-year-old from Lockleaze was a conclusive winner over 12 rounds against the Darlington fighter at Clevedon's Hand Arena. Haskins used his speed and unorthodox style to overcome height and reach disadvantages against his older opponent. The judges scored the bout 118-111, 117-111 and 118-110 in Haskins' favour. Haskins, a former English and Commonwealth flyweight champion and the reigning British super flyweight champion, weighed in eight ounces lighter than his opponent at 8st 5lb 4oz. The bout was part of a 10-fight bill featuring heavyweight star Tyson Fury, who stopped New Yorker Vinny Maddalone in the fifth round.